Not only is Dominican Sister Mary Jo Sobieck a nun, she’s also an internet sensation. The ceremonial first pitch she tossed prior to a Chicago White Sox-Kansas City Royals game in Chicago Aug. 18 — a curveball with what baseball insiders call “12-to-6” action — was a perfect strike. It also didn’t hurt that Sister Sobieck bounced the ball off her bicep before making the memorable pitch. 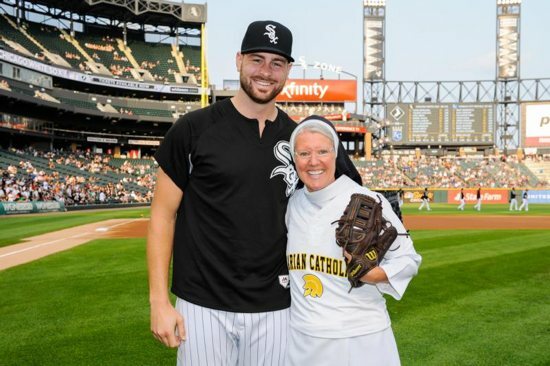 One 24-second clip of Sister Sobieck throwing the pitch had garnered 2.73 million internet views by midday Aug. 21. Sister Sobieck, a member of the Dominican Sisters of Springfield, Illinois, is a theology teacher at Marian Catholic High School in suburban Chicago Heights. She is an alum of Cathedral High School in St. Cloud. On the mound, she wore over her habit a Marian Catholic T-shirt with the number “60” on the back to observe the school’s 60th anniversary. It also was Marian Catholic Night at the ballpark. For her part, Sister Sobieck is modestly nonplussed about it all. “My goal is to just inspire young people to do their best and let God do the rest. It’s a question of giving your all, being resilient, part of a team,” she said on the school’s website. Sister Sobieck’s fame is so great that within two days, Marian Catholic was able to offer a bobblehead figurine, showing the right-hander in peak form. Five dollars of the $25 cost of the bobblehead will be donated to Marian Catholic. “She was pretty good, actually,” White Sox manager Rick Renteria told reporters after the game. “We talked to her a little bit but before we were talking to her, she was talking to someone and she wanted to warm up. She had a mitt and a ball. She gave him (Giolito) the mitt. She stepped back at about 45 feet and threw a bullet. The White Sox lost that night’s game, 3-1, and sat in fourth place in the American League Central Division with a 47-77 record through Aug. 20. Major-league rosters just happen to expand Sept. 1.